Our line of flow meters that measure both gallons per minute (GPM) and liters per minute (LPM) are of the highest quality, and available to you at an affordable price! Very Accurate and easy to install. Constructed of a durable machine acrylic body, corrosion & wear resistant float, and a permanent screen-printed scale. Simply drill the hole into the pipe, and install it with a gasket and 2 clamps. Also available in low-flow ranges. 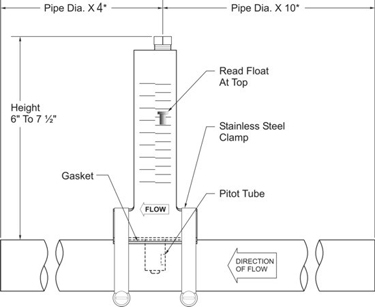 Our flow meters utilize a pitot tube pick up and a hard edged float design to provide a precision water flow reading. These flow meters feature a tough, one-piece machined acrylic meter body, 316 stainless steel corrosion resistant internal parts which makes them safe for saltwater applications. Dual GPM/LPM scale printed on both sides of the meter. Flow rates from 1800 lph to 33000 lph. Corrosion resistant 316SS or Teflon internal float materials. One piece machined acrylic body. Mounts to existing pipe. No unions or adapters required. Mounting clamps and gasket included. This flow meter requires a Minimum Straight Pipe Length Requirement, the meter’s accuracy is affected by disturbances such as pumps, elbows, tees, valves, etc., in the flow stream. Install the meter in a straight run of pipe as far as possible from any disturbances. These Flow meters must be mounted at the vertical (twelve o'clock) position on horizontal pipe only. The pipe must be completely full of water at all times. The meter can accurately measure flow from one direction only. The distance required for accuracy is 10 times the nominal pipe diameter before the meter and 4 times the nominal pipe diameter after the meter.